Recently, along with our little guy, we were able to review The Sea Squad created by Educational Insights. The bright colored puppets on a stick immediately caught his attention. Educational Insights based in Southern California, manufactures playful products with serious educational value, including classroom products, teacher resources, and educational toys and games. Their products are designed by seasoned educators and parents that know learning must be made fun. 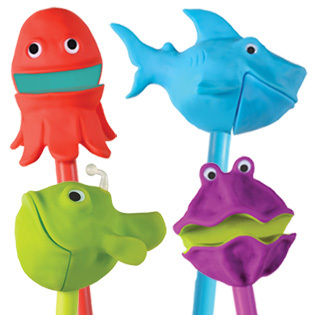 The sea squad includes four whimsical, googly eyed puppets on a stick. No batteries required for these super cute silly faced sea creatures, Flipper the angelfish, Dipper the octopus, Chomper the shark, and Bob the clam. There are two different ways to move the mouths you can use the lever on the handle or you can pull the knob at the bottom of the stick. The puppets are very durable and sturdy. The inventor of The Sea Squad is Educational Insights games and toys manager Brent Geppert, a long time puppet lover. Our little guy loves the puppets, his favorite is Flipper the angelfish, I think its because in the dark the top glows like a real angelfish. Our older boys put on puppet shows for him and make up stories to go along with each puppet. The recommended age for the puppets is three, our guy is just over two and plays well with them. I like that the puppets will help in his communication skills. All the kids use their imagination with them, making up stories.,. and that helps to build on their creativity. My grandchildren would absolutely flip over these! I've got to get them some. I think I know what this year's Christmas theme will be! These are so fun! We homeschool a preschooler and first grader and these could be used for so much! My boys would LOVE these!! We just started doing Tot School and these would be wonderful to add to our imaginary play!